Daniel Warren Johnson is one of the best action storytellers working in comics right now, and his work on titles like Dark Horse’s The Ghost Fleet and his ongoing Space-Mullet webcomic has revealed an incredible talent for exhilarating, engaging battle scenes. His new series from Image Comics and Skybound Entertainment, Extremity, delivers no shortage of heart-stopping action, but it’s bolstered by a strong emotional foundation as Johnson tells the story of Thea, a young artist who loses her drawing hand and her mother when her people are attacked by a rival clan. 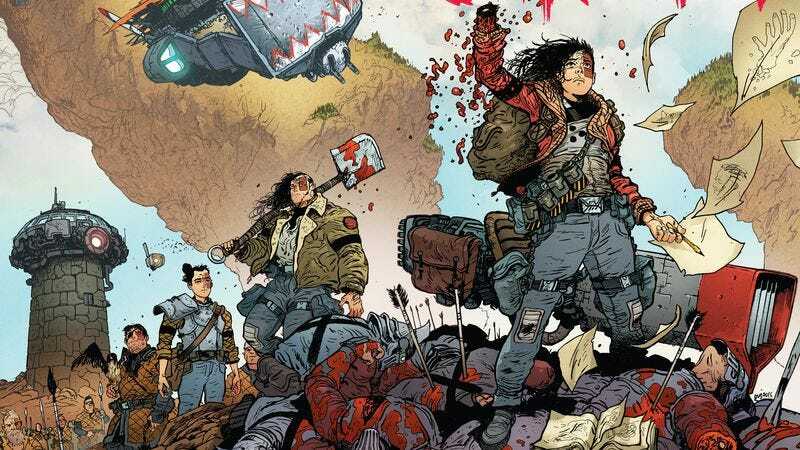 With a visual sensibility that combines medieval design with futuristic sci-fi elements and a heavy dose of Mad Max, Extremity is a stunning book with bold coloring from Mike Spicer, and The A.V. Club reached out to Johnson to learn more about the inspiration for the series, how he’s switching up his art style, and collaborating with Spicer. “I’m trying to toe the line between always trying my hardest and giving myself room to rest and be at peace with the lines I make. This actually frees me up to be a bit looser in my approach to drawing a page, and giving new materials a try. I’m inking on smooth paper now instead of rough, and I’m loving it, and I’ve been using more tech pens and a bit less brush for my inking, just to switch things up. I really love how sharp an .08 micron looks on smooth bristol. Sorry, I know that’s super art nerd stuff,” Johnson says. Readers can get swept away in this thrilling story when Extremity #1 goes on sale this Wednesday, and below are some exclusive preview pages of what’s in store for Extremity #2, out April 5.